ProFile® comes with a comprehensive auditor that runs up to 2,800 diagnostic checks of your tax returns. 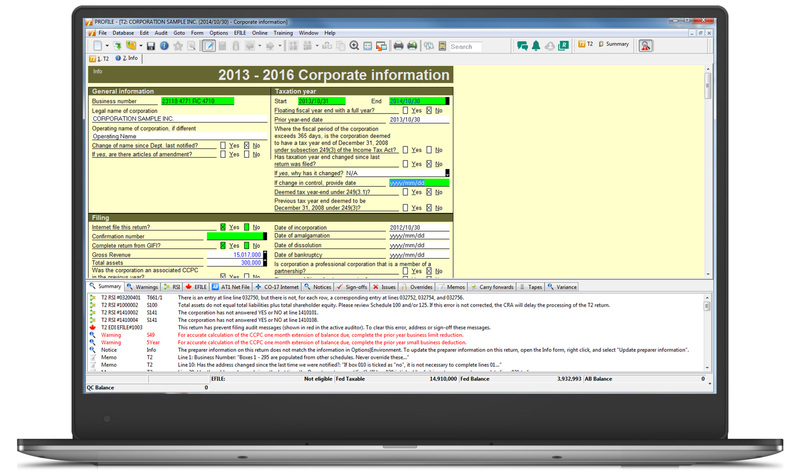 This extensive built-in auditor with real-time auditing constantly scans a tax file and instantly flags missing or erroneous information. The auditor also makes suggestions on optimizing the return, and reminds you about memos you may have entered, amounts you may have calculated or review marks that you annotated on a tax return. There are two types of auditors – Passive and Active. As you work on a tax file, the Passive Auditor reviews the return and when it detects a potential error, highlights that area of the tax file. When you move your cursor over that field, an audit message appears. Missing data that is necessary for filing. Amounts on tax slips that fall outside the tolerance range. Claims that may be more beneficial on a spouse’s return. Filing requirements specific to a return (taxpayer subject to minimum tax). Suggestions to reduce a claim. Other forms or elections that may be necessary but have not been included in the tax file. The Active Auditor displays a list of audit messages that apply to the current tax file. These include passive audit messages mentioned above, as well as notices or processing errors, EFILE messages, fields with memos or calculations attached, overridden fields, or fields with review marks attached. Learn more about ProFile’s auditor as well as other time-saving features today. This article is authored by Intuit® ProFile team. For more information, visit the ProFile website .